Changes of season in the fashion world are my favourite times. With the new Spring line recently landing at Marks & Spencer i had the privilege of choosing a few pieces and playing around with their extremely easy to use and FUN Style Boards. Needless to say i spent hours having fun on my style boards and Viewing the new Vogue Edit. With my ‘picks’ i wanted t choose items that were going to be wearable in this non-spring time, but that could be carried through also. Lets face it, spring in the UK is normally a continuation of winter any-ways, but i wanted to at least feel a little Spring-esque even in the cold. My other final thought was remix-ability. This is something that since by spending ban commenced has been important to me. If i am adding items to my wardrobe i want them to multi-functional. Dressy and casual and everything in-between. So here’s what i chose. 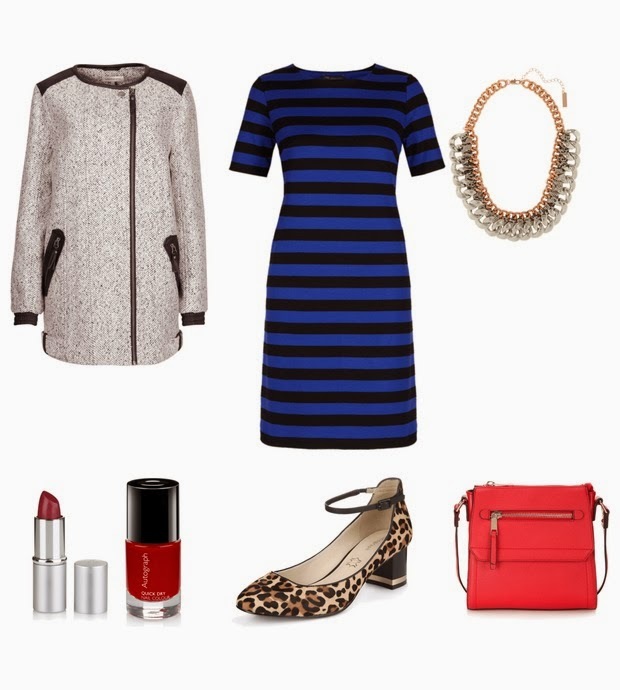 This is the dress, coat, shoes and bag i have picked for my Spring Style Edit. I have to be honest i am totally smitten with all of them. They are just absolutely quintessential to my Spring remix clothing capsule. Many an outfit can be made with these few items. This Beautiful Blush Pink Coat screams Spring to me, with its long-line on trend cut to its pretty pastel colouring, this coat is the epitome of Spring Fashion. Here i’ve remixed the Bold Stripe dress and played on pattern and texture with the bag and the boots, all tied in with some silver accessories and some playful pink make-up. either way it looks chic and pulled together. This style board i nick named mum-on-the-run as it is something i would pull together for school runs, errands and general running about , whilst still remaining Spring stylish and chic. The red lipstick and nail polish adds easy-chic points. And that equals one happy mamma! So these are my Spring 2014 picks, what do you think? Great boards! I'm not a Mum, but the Mum on the run board is my favourite; easy weekend style!